Serving wedding guests buffet-style food at a beach wedding helps keep the celebration on the beach. 3 How Long After Cooked Food Is Frozen Should It Be Eaten? Serving food buffet-style at a beach wedding is a way to avoid the food service issues that a beach wedding presents. Buffet-style food eliminates the need to pay wait staff to serve wedding guests. Furthermore, buffet food does not need to be prepared on site. Heating and cooling kitchen equipment keeps the food at the right temperature during the event. Therefore, it is advisable to choose food that will keep well in heating and cooling appliances under the hot sun at the beach. Because a beach wedding takes place by the ocean, incorporating seafood into the buffet menu helps maintain the theme. Shrimp cocktail will make an appropriate appetizer because it is not only seafood, but it holds well in ice. As long as there is enough ice on hand to save the shrimp from the hot sun, this appetizer should maintain its taste and texture long enough to serve at the buffet. Grilled fish filet is another menu item that will suit the theme of a beach wedding. Serve this item as an entree by grilling it ahead of time and then serving it in a food warmer. Any type of fish will do. Just choose the type according to your budget. Chicken breasts, whether grilled, baked, marinated or served in a sauce, hold well in food warmers. Unlike steak, chicken breast is the same temperature for all guests because undercooked chicken is unsafe. Therefore, cooking the meat to different temperatures for different guests is not an issue. Chicken breasts work well in buffets because they are not messy or difficult to serve. If you want to count precisely how many portions of vegetables you will need for guests at a beach wedding, serve vegetable skewers. Each skewer counts as one portion. Alternatively, serve grilled or sautéed vegetables in a food warmer. Keeping to the beach theme, serve summer vegetables such as peppers, mushrooms, zucchini and corn. Mashed potatoes are inexpensive to make and hold well in food warmers. If they start to get a little dry, just add hot water, cream or milk to the batch and stir. 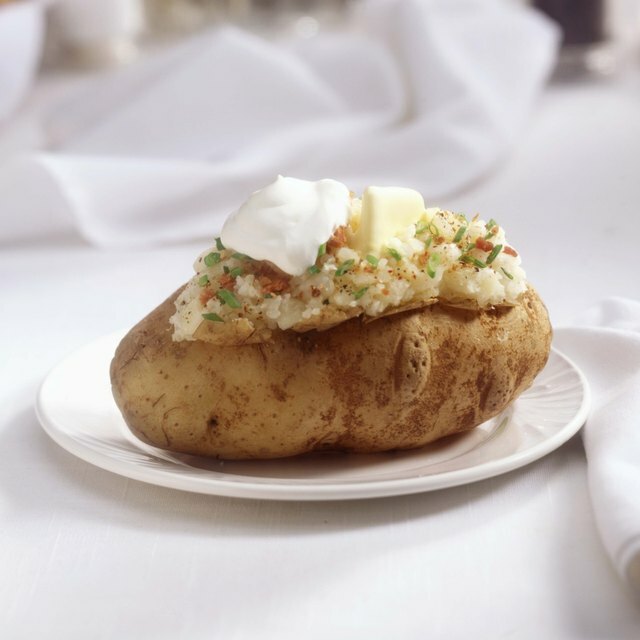 Baked potatoes are a viable alternative to mashed potatoes. You can count each potato as an individual serving and their own skins keep them neat and moist. Make sure you do not overcook baked potatoes before placing them in a food warmer. They will shrivel in their skins as the day goes by if they are overcooked. Fresh fruit is hydrating, nutritious and compatible with a beach-themed wedding buffet. Serve it throughout the meal so guests will eat it as an appetizer or a dessert alternative to cake. Do not be afraid to put out whole apples or bananas so guests can take the fruit and walk the beach with it.